Over the course of Linda's career, she tried an array of skin care products looking for the best results. Through years of experience with her clients, coupled with working with an international skin care company as a top selling Independent Sales Representative and creating skin care products for other companies, Linda has gained the expertise to create her own, unique one-of-a-kind skin care products. Linda's skin care products are hand crafted in micro-batches, using the highest quality of ingredients and without harsh chemicals. She believes that ingredients really do make a difference, and that while some skin care products might give you immediate results, they quickly disappoint and are rarely sustainable. Previously, her line of products were only available to her direct clients. Now, they can also be purchased from selected élite spas. Linda promises that if you give her 90 days she will change your skin. The skin care program is simple and straightforward - no need for a million different products and a day regime versus a night regime. It's designed to be both result oriented and affordable. She gives your skin everything it needs in as few steps as possible, transforming back to its youthful glow. Linda's passion extends to animals. None of the products are tested on animals and a portion of the proceeds from the sales for products will be given to various animal charities. She hopes one day to create a program in grade schools, educating children on how animals benefit our lives in so many ways. Linda feels by giving back to something she cares so deeply about, is her way of doing something good for our earth. 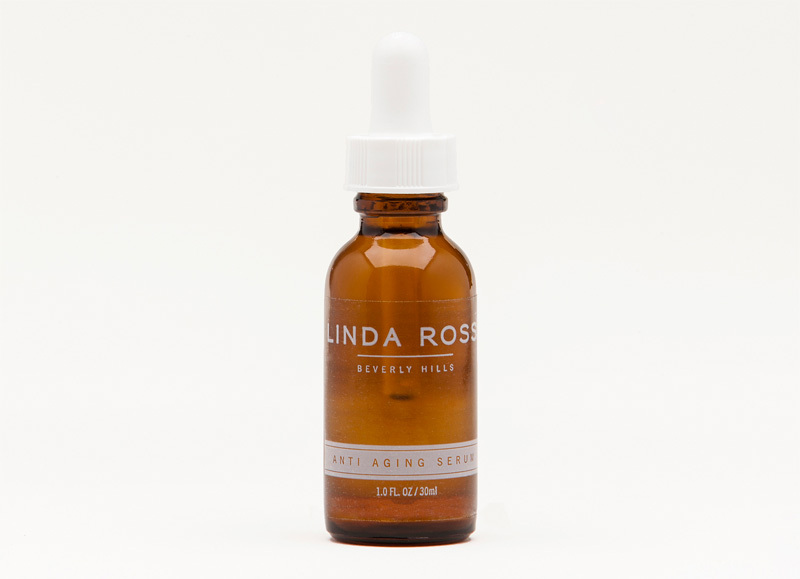 A concentrated serum formulated to dramatically hydrate the skin and slow down the effects of aging. It's designed to work synergistically with the skin's ability to rejuvenate. This powerful anti aging cream works synergistically with your skin to slow down the effects of the aging process. It's designed to stimulate the skin's ability to rejuvenate, repair and heal. Organic, therapeutic grade essential oils are added to enhance elasticity and help wrinkle reduction. This anti aging cream is hydrating and nourishing enough for use day and night, including the eye area. Propolis and Royal Jelly have been used since the time of ancient Egyptians for their curative and nutritional properties. Propolis is a natural antibiotic and antiseptic, helpful to the healing of many skin conditions. Royal Jelly contains essential vitamins, minerals and amino acids, providing the skin cells with vital supplements which aid in deterring the aging process. The first step to healthy skin is proper cleansing. This foaming cleanser is gentle enough for all skin types. Natural ingredients in the formula protect the pH level of the skin without stripping it. Polishes away top layers of the epidermis which dull the skin and clog the pores. Reveals softer and brighter looking skin. MicroDerm Scrub also enhances absorption of all skin care products and creates smoother skin texture. Colostrum Mask treatment is a natural beauty product sourced from grass-fed cows raised antibiotic and hormone free. It contains the highest levels of growth factors, antibodies and proteins which are known to stimulate cell regeneration and revitalize tired looking skin. The immune boosting properties and polypeptides contained in the mask help to improve elasticity and collagen. Skin Tightening Mask treatment is designed to stimulate blood flow to the face and neck area. The circulation of blood flow delivers nutrients and oxygen to your skin cells, while helping to remove toxins. You can feel the mask pulsate as it tightens. Use the Mask Activator solution to apply and remove the Skin Tightening Mask powder treatment. Propolis Mask contains Bentonite Clay which is derived from volcanic ash. It exerts a negative electromagnetic charge, which draws out positively charged toxins in the skin. The amazing extraction powers opens pores and removes impurities. Propolis is a natural antiseptic and antibiotic with fungi and germ fighting properties. When combined, these ingredients extract toxins from the skin and help it to heal. Works on blemishes, bug bites and ingrown hairs. A light, invisible powder with active natural ingredients which absorb excess oil without drying out the skin. Good for combination and oily skin.